Sometime after streetcar service ended in 1952, Westchester Street Transportation Company Route H from White Plains was diverted across the Odell Avenue bridge to cover the route of the #5 Nepperhan Avenue streetcar. In the above photo taken yesterday, bus 264 has just made that move. To the right, near the red-light camera is the location of a former passing siding of the #5 streetcar, then operating on the east fringe of Nepperhan Avenue. For further description, please go back in this thread to posts of July, 2014. The A & P supermarket near this bus stop is now closed and empty of all shelving. No new tenant has moved in. 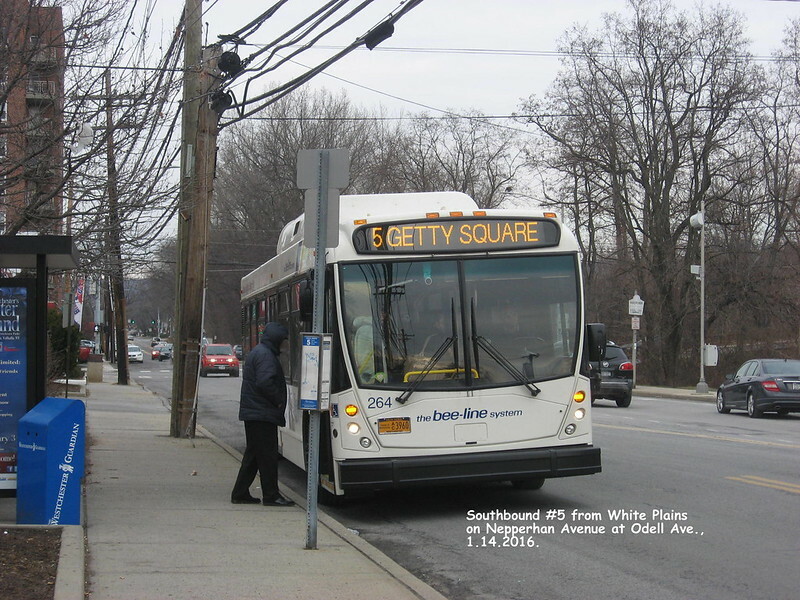 Route 5 stops here half-hourly. Southbound #9 North Yonkers Loop stops here hourly. From the Herald Statesman in 1950, a trolley in New Rochelle and three buses (a Mack, a GMC, and a Twin Coach). Let's see whether this link to my photo-of-a-photo works. It may take a few seconds to upload.